How much does Wall Street cost the country? Bank of America had impeccable timing when it decided recently to charge a $5 monthly fee for the privilege of using its debit cards. The notorious bailout baron, having just announced 30,000 job cuts, decided to stick it not to the platinums, not to the golds, but to the debit card masses. Occupy Wall Streeters could not have asked for a more perfect target. They’ve melted the bank’s debit cards, organized “mass account closures” and rallied outside numerous branches around the world. So thanks, Bank of America, for making one of the costs of Wall Street greed so crystal clear. But wouldn’t it be illuminating if we got a monthly bill tallying up all the ways the financial industry makes the 99 percent pay for the pleasures of the 1 percent? § Oil speculation: $82 per month. Ordinary Americans pay extra at the pump because of high-roller gambling in oil futures markets. When gas was nearly $4 per gallon in May, University of Massachusetts, Amherst, professor Robert Pollin estimated [see PDF ] the monthly cost of this speculative premium at $82 for the average two-car family. A new report  by Better Markets finds that excessive speculation on food commodities also inflates our grocery bills. Americans for Financial Reform, Maryknoll, the Institute for Agriculture and Trade Policy, and other groups are fighting for regulations that could end such brazen price manipulation. Among the proposals: strict limits on how much of the market a single speculator can corner. I’ve blogged here recently about the costs of education. Well, some new numbers came out this week to illustrate just how much college costs have been climbing. Published in-state tuition and fees at public four-year institutions average $8,244 in 2011-12, $631 (8.3 percent) higher than in 2010-11. Average total charges, including tuition and fees and room and board, are $17,131, up 6.0 percent. Published out-of-state tuition and fees at public four-year colleges and universities average $20,770, $1,122 (5.7 percent) higher than in 2010-11. Average total charges are $29,657, up 5.2 percent. Published in-state tuition and fees at public two-year colleges average $2,963, $236 (8.7 percent) higher than in 2010-11. Published tuition and fees at private nonprofit four-year colleges and universities average $28,500 in 2011-12, $1,235 (4.5 percent) higher than in 2010-11. Average total charges, including tuition and fees and room and board, are $38,589, up 4.4 percent. Published tuition and fees at for-profit institutions average an estimated $14,487 in 2011-12, 3.2 percent higher than in 2010-11. 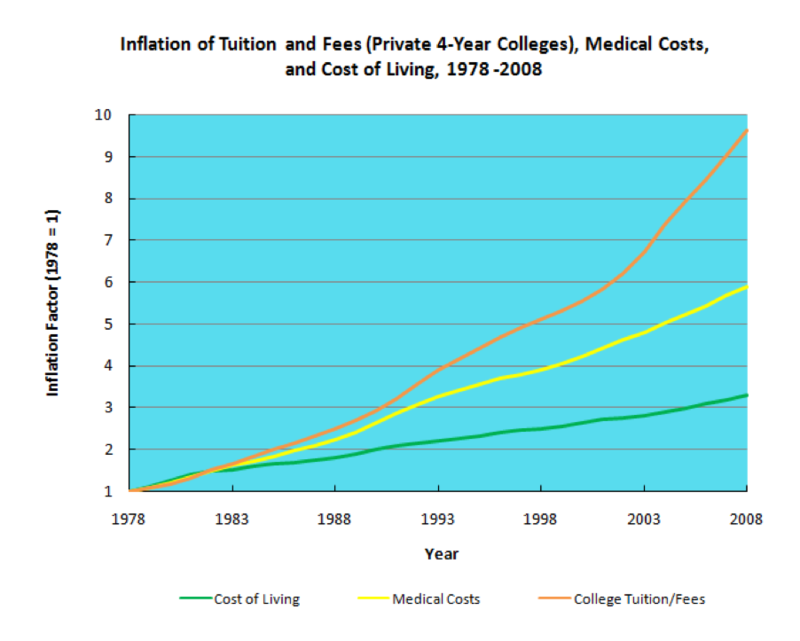 The moral of the story is, college costs are climbing much faster than the cost of living and even medical costs. Get a higher education while you can still afford it. One video (above) features the stunning actress Kirsten Dunst, while the other stars artist and poet John Giorno. Watching the videos, I’m reminded of Andy Warhol’s screen tests. I wouldn’t be surprised if they were an inspiration. Occupy Wall Street: It Wants Your Brains! I hope later today to get around to posting some interesting links about the movement and wealth/income equality, so stay tuned. No, they’re not zombies. 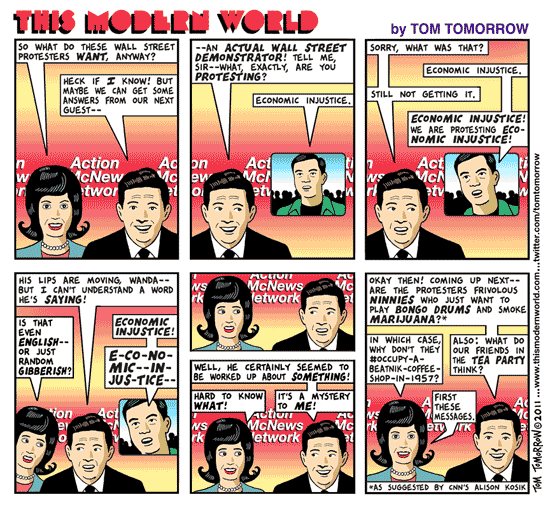 They are the Occupy Wall Street demonstrators. Despite what Fox’s Bill O’Reilly and other critics will tell you, they aren’t just a bunch of “bored morons who want handouts.” Their job would be so much easier if that were so. No, the Occupy Wall Street movement is attempting to do something much more difficult: It is looking to re-ignite the imaginations of Americans and, I think, to reinstate the rule of law. To do so will take brains. Lots of brains. Yours and mine. And those brains are largely out of practice. Americans, as well as the citizens of many countries around the world, have become used to living in dead time. It is time without real thought. It is time without creative life. It is time resigned to enduring the entropy of our misguided economic and political systems until they finally lead to our demise. Look, I don’t care from what viewpoint you approach life — conservative, liberal, moderate or otherwise; you know something is wrong. Some people look at it in religious terms, some philosophical, some political. But there are some basic things that large majorities of us can agree upon. We no longer have the rule of law. We have the rule of money. Quite simply, if you are one of the few that have money, you have your own set of rules. If you are an employee of Citigroup, Bank of America or some other large Wall Street firms, it’s become habit to expect something for nothing from the government if things go awry. It wasn’t like 2008 was something new in anything other than the scale of the losing gamble and the ensuing handouts. For the employees of these companies, it’s perfectly acceptable to overextend your company by billions of dollars through bogus financial arrangements, bring the national economy to its knees and then receive a bonus of millions of dollars at the end of the year for your work — with government assistance to boot. If you are a janitor who makes above minimum wage but probably not a living wage, you can expect little assistance when you have trouble making ends meet. And if you happen to miss a payment by a few days on a mortgage from one of those aforementioned companies, you can expect them to charge you late fees without mercy. And, ultimately, you will be foreclosed upon if you don’t play by their strict rules. You can also look forward to seeing the defenders of these large financial institutions on television talking about how lazy and greedy YOU are for overextending yourself. No, in today’s world, it doesn’t matter if you do everything you are supposed to do. You go to college. You end up with thousands of dollars in debt. If you are lucky, you are able to get a full-time job. But your wages are stagnant. Health care costs and other expenses climb every year, but your income does not. You try to be responsible and invest what little money you have, only to have it squandered away by those on Wall Street who have nothing to lose. You do not enjoy the fruits of your labor. You do not get ahead. You do not win. According to the Economic Policy Institute, inflation-adjusted incomes of the top 1 percent of households increased 224 percent between 1979 to 2007. The top 0.1 percent experienced a 390 percent growth in income. But for most of us — the bottom 90 percent — income grew by only 5 percent between 1979 and 2007. All of that income growth, however, occurred in the unusually strong growth period from 1997 to 2000, which was followed by a fall in income from 2000 to 2007. And does pointing out that disparity mean we are jealous and envious of the top 1 percent and think that every last one of the rich are greedy and corrupt? It is a recognition that the system is broken. It is a recognition that money and politics have mutated together to form a giant squid sucking the resources of this country, which include us — because, yes, we do have value. People handle this realization in different ways. Some people respond with bullying of and violence toward minorities. Some people try to ingratiate themselves to this morally bankrupt system. Others seek to imagine something new and create a more just world. And that is where Occupy Wall Street enters the stage. It may not have a uniform message, but perhaps it doesn’t need one. Its presence has already created a dialogue about inequality and corruption that many Americans felt but did not know how to express in words. The response from the ruling class has been telling. They are frightened of the conversations beginning to occur. How else can you explain their employment of law enforcement to bombard peaceful protesters with tear gas, pepper spray and batons? Why would you use such extreme violence against those who have repeatedly expressed a desire to be non-violent and have largely remained so? It is because breaking up the occupations is not enough. They want to discredit the participants as violent extremists and ensure that no one dares imagine a world wherein the rule of law applies equally to everybody. That is a world in which they would begin to lose their ill-gotten gains. That is why Occupy Wall Street needs you. It needs me. It needs all of our family and friends. The spectacle has sparked something in our collective brains. We need to feed it. We need to believe again that this isn’t the way things have to be. We are the 99 percent, and as individuals we are no less valuable to America than the wealthiest 1 percent. We should expect to be treated that way. Ultimately, money should not make the man. Don’t clean the corners. No, let the spiders hang. I’ll watch the webs grow wider, the tales those spiders spin. Is there a language in those shapes? Do spiders write what they know? Is our tale being spun there in silk, in the margins of the window? It’s a script for eight eyes to read, but I wish I could understand it, too. I guess what I’m saying is, don’t be surprised if I perform every once in a while for the spiders in the room. I want them to remember me. I want to be caught in their web. It’s better than being here. It’s better than being left for dead. If a crowd of spiders sense the sadness here, perhaps they’ll interfere. Maybe they’ll bite me and grant me a superhero career. It’s all I can hope for. It’s all I can embrace. It’s all I can do when, if I watch those spiders hanging, I see me dangling in their place. * Just a reminder that this is FICTION. No need to worry about my state of mind, dear readers. I could not confirm if Matt Foley was one half of the couple "getting intimate" in a van down by the river this past weekend. This blog has really taken a turn for the gutter it seems. But don’t blame me. Blame it on the people (and dogs) of Yankton. I’m only reporting what is going on in this fine (and frisky) city. Officer out with vehicle at Riverside Park near Capital building. Contact made with male and female who were getting intimate with one another in a van down by the river. A cab was called and they were sent on their way. Well, I’m sure you’ll agree that is good enough reason to post the old Saturday Night Live clip featuring Chris Farley as Matt Foley, the motivational speaker who lives in a van down by the river. This innocent-looking Golden Retriever is obviously not the one from the story told here. I just wanted to demonstrate that not all Golden Retrievers are after your leg. It’s been a real crazy animal week around Yankton. There is the black dog chasing people near Hillcrest Golf Course. There was the cat that reportedly “mauled” a man and scratched his eyelid. A report was received at 2:46 p.m. Friday that a Golden Retriever was attached to the leg of a pedestrian — although not in an aggressive manner. After several attempts to remove the dog from the pedestrian’s leg, its owner was finally able to gain control of his pet and take it home. Unfortunately, all I knew was contained in those two sentences. Well, today I had the opportunity to speak with an eyewitness to the incident. Let me share with you, dear readers, what I learned. The pedestrian in question was an off-duty police officer (not my source, by the way) who was walking his poodle, “George Bush.” Yes, the poodle’s name is George Bush. It was while walking the dog near the intersection of Eighth Street and Maple Street that the Golden Retriever made its move on the unsuspecting pedestrian. The dog was big but managed the acrobatics of scrunching down enough to get its front paws wrapped around the man’s leg while proceeding with its amorous — and, from what I was told, vigorous — behavior. During this time, the man had picked up little George Bush and was holding him away from the “action,” presumably to protect his innocence. My source tells me that the dog was so infatuated with the leg that George Bush could have probably run along home unmolested. In fact, the Golden Retriever was so persistent and unrelenting that Yankton’s animal control officer was called to the scene to assist. The officer succeeded in peeling the dog off of the pedestrian’s now wet leg and very nearly had it in a cage when the Golden Retriever evaded capture — only to return to the beloved leg! I’ve no idea how long all of this took to transpire. Eventually, however, the owner of the “giggity giggity goo” Golden Retriever showed up on the scene, and the matter was resolved for good. According to the owner, the Golden Retriever was purchased as a hunting dog. Needless to say, my source was still having trouble recounting the story days later because it was still so darn hilarious to recount. It’s incidents like this for which Youtube was created. Unfortunately, no video of this lusty drama is known to exist. On a serious note, my condolences go out to the pedestrian. It sounds like he had quite a traumatic experience. All Hail My Cookie Monsters! This is my plethora of Halloween cookie monsters. Do these look good enough to get me out of being dismembered with a chainsaw? It’s true, the Not-So-Secret Admirer and I got busy last night — making cookie monsters! I felt bad about not getting a costume together for a Halloween party I’m attending, so I thought I’d try to sweeten my friends up with cookies. It’s with good reason that I’m trying to get on their good side: They’ve threatened to dismember me with a chainsaw for not having a costume. I don’t take these threats lightly — not from this group. Despite my hope that I don’t die, I did give blood today so that if things go bad I don’t make as much of a mess. I’d hate for them to have to clean up after me. 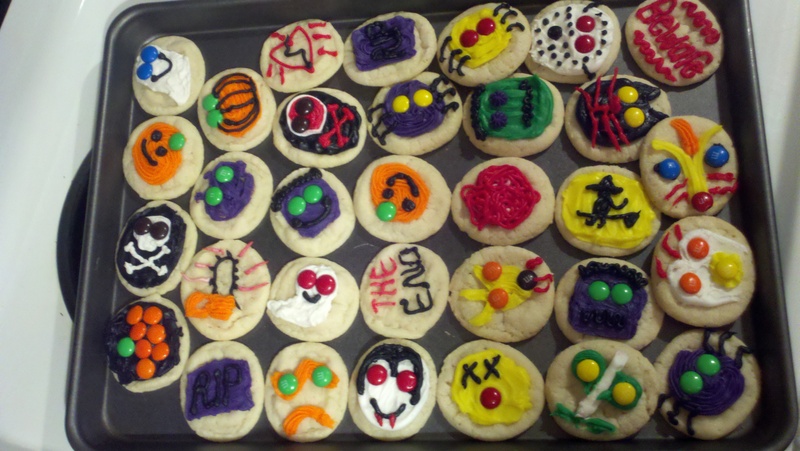 When I brought up the idea of doing something cool for the party, it was the NSS Admirer who came up with the decorating cookies idea. She came armed with all the tools to make it happen. She also did the lion’s share of the decorating. If you look at the pictures, I think you can discern the sharp contrast in artistic ability. Hers look very accomplished, while mine look very unaccomplished. 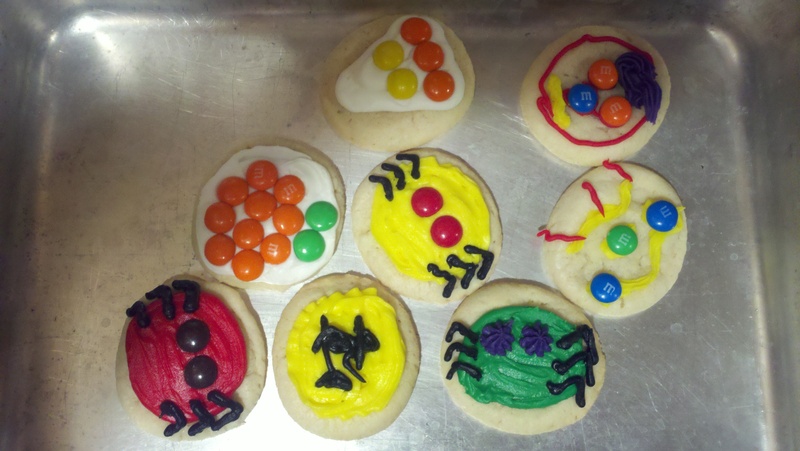 Cookie decorating has never been my strong suit. I prefer munching on them. More homemade Halloween cookie monsters.